Burundi's President Pierre Nkurunziza is sworn in for a third term at a ceremony in the parliament in Bujumbura, Burundi, Aug. 20, 2015. 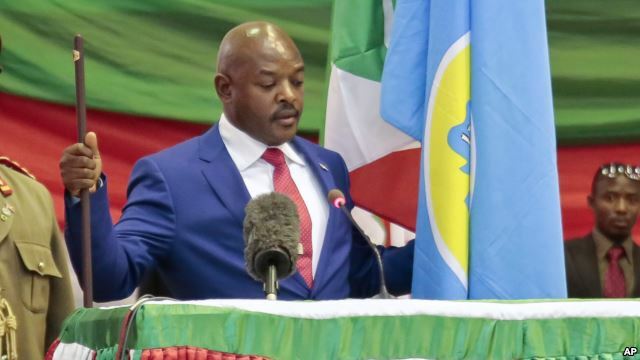 NAIROBI: Burundi’s president, Pierre Nkurunziza, was sworn in for a third term Thursday, six days ahead of schedule. The government has not explained why the swearing in was moved up with virtually no advance notice. In his inauguration speech, Nkurunziza pledged to end months of violence in Burundi and called on those who fled the country to return. But some experts say he will have a hard time running the country, given that many Burundians think he should not be president at all. Local media report that no foreign heads of state were present at the ceremony, although some African countries, as well as China and Russia, sent their ambassadors. In his oath, the president swore loyalty to the constitution, to assure national unity and the cohesion of the people. 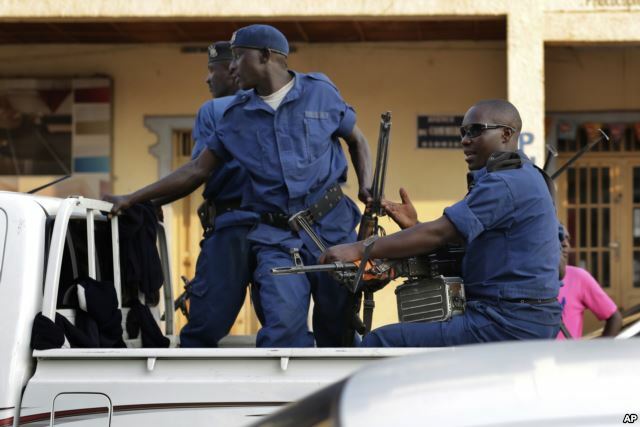 Burundi – Police drive by the scene of a grenade attack on a parked car downtown Bujumbura, July 20, 2015. He also promised to bring stability following months of violence that claimed the lives of at least 100 people and prompted more than 100,000 to flee the country. The government accuses opposition groups and anti-government demonstrators of causing the violence. Political analyst Pierre Claver says the president will face challenges moving the country forward after the persistent protests against him seeking a third term. “The president has experienced fresh opposition from a group of people who are really young if I consider the age of demonstrators, and it will be very difficult for the government which will serve this term to satisfy or be able to calm down the anger of the youth especially. I think also the opposition parties are going to make big demands and will cause many obstacles to the president’s wishes,” he said. Nkuruniza’s plan to seek a third term in office was deemed unconstitutional by the opposition. But the president ran and won 69 percent of the vote. Opposition parties have said they will not recognize a Nkurunziza presidency. Claver says that with the government facing pressure from the U.S. and other Western countries to start a dialogue with opponents, it may move Burundi closer to countries like China and Russia. “Money that [was] coming from traditional countries like France or Belgium or Europe will come probably from those countries like China or Russia or any others, so I think that’s how we could interpret the presence of by this countries,” he said. Tensions remain high in the capital, Bujumbura, where many observers are worried the country’s army shows signs of division following months of political crisis. Voice of America: Burundi Holds Surprise Early Inauguration.